The FLOOD-IT range of Mobile Lighting Products has become a tool box essential, thousands are in use everyday providing lighting solutions for the most challenging of situations. 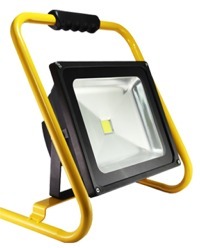 The FLOOD-IT mobile lighting range has been designed with two things in mind; quality of components and longevity. Feedback from users stressed the need for a product that is both robust and reliable. Fully rechargeable from the included mains or in-vehicle charger, the FLOOD-IT is totally portable and can easily be stowed away. Fully IP65 rated and tested for all conditions whilst on trial by the fire service, users can be confident that the FLOOD-IT will work come rain, shine, mud or dust. Saving hours of rigging up floodlights from the mains and bulky equipment, not forgetting the obvious health and safety benefits of being cable free, users can just get on with the job in hand rather than wasting energy on having to light their environment.